Martyn Hilbert's Railway Photography - Last additions - CO/CP Stock Birds Scrapyard, Long Marston. CO/CP Stock Birds Scrapyard, Long Marston. In a scene that would give todays Health & Safety brigade a seizure, Pre-war withdrawn CO/CP Stock Cars were stacked at Birds Scrapyard, Long Marston on October 12th 1981. The car numbers were 013184, 54248 & 53020. 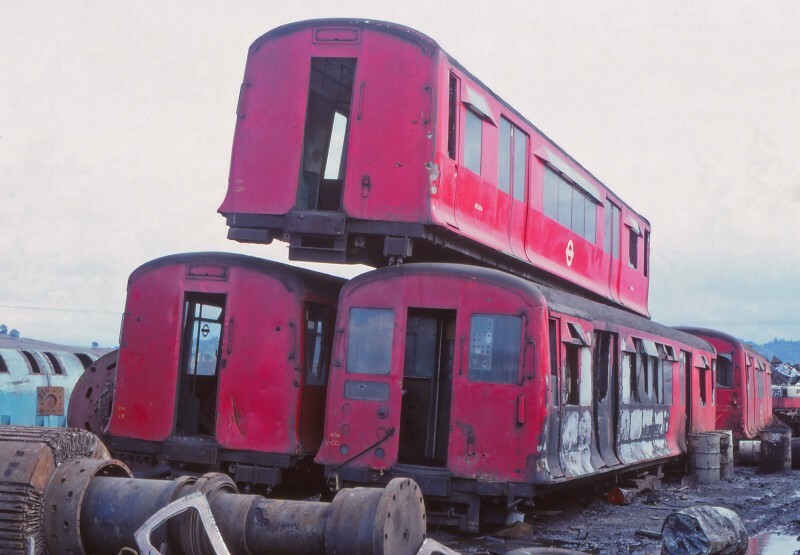 The last surviving vintage CO/CP trains were ousted from District Line services in 1981 being replaced by newly-delivered D78 Stock, which has now come to the end of its operational life and is in turn being replaced by new Bombardier S Stock units.